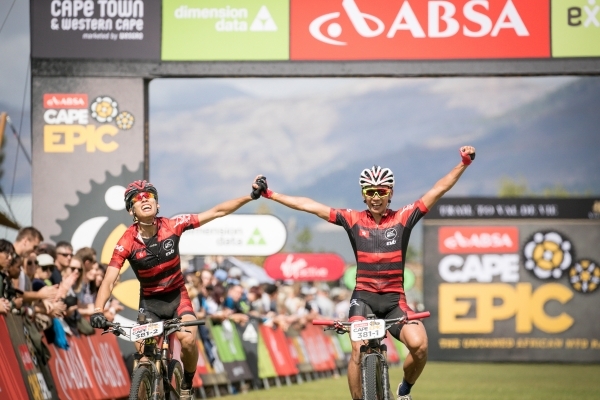 With 650 teams set to start the 2019 Absa Cape Epic on the 17th of March, there are 1 300 individual stories of dedication, perseverance and overcoming the odds to simply reach the start. It is sadly impossible to tell every story or to highlight every unique achievement. So here are a few of the most remarkable tales, the origin stories if you will, of the superheroes taking on the Untamed African Mountain Bike Race. Many families struggle through Sunday lunch without an argument so Johan and Pieter Bezuidenhout are a rare breed of father and son. Johan has completed all thirteen Absa Cape Epics he has started and four of those have been with his son Pieter. “It focuses the mind and body to a common goal which keeps you young” the 66 year old patriarch of the Bezuidenhout family said. His son is no stranger to extreme challenges off the bike too, the 35 year old has summited Mount Everest and Cho Oyu, the sixth highest mountain in the world, in the Tibetan Himalaya. For many, the physical challenge of the Absa Cape Epic is the primary factor dissuading them from attempting the race. For Thando Klaas riding his bike for eight days is not a problem, but the entry fee was. Through his work at the Stellenbosch bike shop, BMT; Klaas was able to join the BMT Fairtree Academy. In 2019, after watching a number of his peers in the academy and songo.info ride the Absa Cape Epic he received his chance thanks to Woolworths. “I've watched and had all the songo.info riders doing it and talking about it. So I also wanted to have the same experience and to wear a development jersey” Klaas confessed. “Coming from Kayamandi, living in the shacks, being able to ride the Absa Cape Epic is an amazing story. If it wasn’t for mountain biking I could so easily have been like my friends that are busy doing drugs” the BMT Woolworths rider recounted. Overcoming life-threatening illnesses is an inspiration often cited by newcomers to ultra-endurance sports. In the 2019 Absa Cape Epic field there are a number of cancer survivors who have decided to grab life by the horns and make the most of their second chances at life. “As physical challenges go, this is low down on the list of what people have overcome in the history of Absa Cape Epic, but thus far it's definitely been a factor for me” Oscar Foulkes said, playing down his story. “Early in 2016 I had six weeks of radiotherapy for cancer on my vocal chords” Foulkes explained.” By March, I'd lost 10kg (over 13% of my body weight). My body was a mess. I've put most of the weight back on again, but one of the 'changes' as a result of the five surgeries since 2006, as well as the radiotherapy, is that I can't breathe the same volume of air as before. Having the Absa Cape Epic, in 2017, as a target was a great motivator for getting going again, when I could barely ride up the road.” Three years later Foulkes is seeking to join the Amabubesi finishers club, adding the 2019 race to his finishes in 2017 and 2018. While Foulkes and Oliver are in remission, Juan Pedro Vázquez Reyes will be battling his illness during the 2019 Absa Cape Epic. The rider from Spain has Ankylosing spondylitis an inflammatory arthritis which causes the vertebrae to fuse and the spine to become rigid. “Despite the incapacitating and chronic disease, I have completed three IRONMAN triathlons and other ultra-endurance tests, like the Titan Desert in Morrocco” Vázquez Reyes said. “I collaborate with the national coordinator of Ankylosing spondylitis patients in Spain and I participate in the rheumatology congresses. Through riding the Absa Cape Epic I would like to make the disease more well-known, to reach a quick early detection for future patients" he nobly elaborated. Taking the fight, metaphorically speaking, for the honour of inspiring the next generation of sporting talent from the rugby and cricket stars who so often grace the Absa Cape Epic honour roles is former professional netball player Adéle Niemand. Niemand represented the Protea netball team from 2005 to 2015 and has set herself the goal of inspiring young women.